Developer time is focused on work that matters — Much of the work of frequent integrations is handled by automated build and testing systems, meaning developer time isn't wasted on large-scale error-ridden integrations. Software quality is improved — Any issues are detected and resolved almost immediately, keeping software in a state where it can be safely released at any time. Faster Development - Integration costs are reduced both because serious integration issues are less likely and because much of the work of integration is automated. 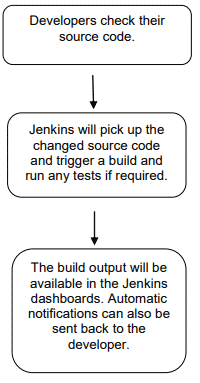 Following flow chart represents the work flow of Jenkins. Continuous Integration is the practice of running your tests on a non-developer machine automatically every time someone pushes new code into the source repository. 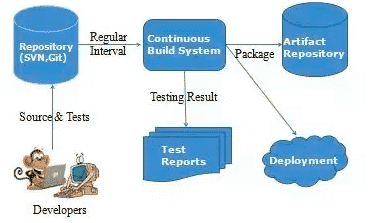 Built on top of Continuous Integration are Continuous Deployment/Delivery where after a successful test run your instantly and automatically release the latest version of your codebase. Makes deployment a non-issue and helps you speed up your development. 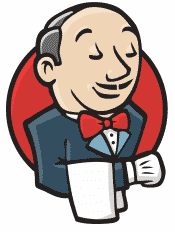 Jenkins will continue to check the source code repository for further changes made in the source code, and the whole process will keep on repeating (functional tests).